This is a very simple and basic device that you might have seen displayed near to the tobacco cabinet in the supermarket or petrol station. People choose them because they look like cigarettes (often an LED in the tip lights up when you take a drag) and they seem cheap when compared to normal tobacco cigarettes. There are many drawbacks to these devices; they are not very efficient at delivering flavour or vapour because the battery in the cigalike is weak and does not last long before it needs recharging. Overall, the cigalike provides a poor quality experience for anybody who is trying out vaping for the first time. For many smokers, cigalikes are the start of their route into vaping but unfortunately some people return to smoking tobacco cigarettes because their first vaping experience using a cigalike was unfulfilling. 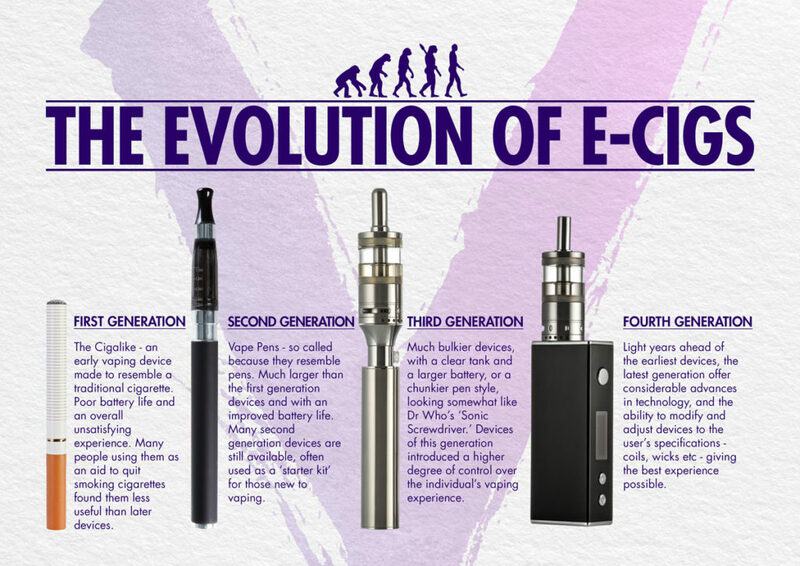 Surveys show that people who stick with vaping move quickly from these first-gen devices to the second-gen products described below. Second generation electronic cigarettes usually look a bit like pens (you may even hear them called “vape-pens”) and they are also larger than cigalikes. When using a typical second-gen e-cigarette, you need to manually press the ‘fire’ button while you inhale. These personal vapourisers also feature batteries of much larger capacity than cigalikes (mostly 3 -7 times larger; 450 – 1100 mAh), meaning that they can provide you with enough vaping power for a day or two before they need to be recharged. The battery of a second generation e-cigarette usually features a 510 screw threaded connection which will fit onto a wide range of e-liquid atomisers/clearomisers. Some mid-size electronic cigarettes will also allow you to adjust the battery power either with the help of two tiny buttons or by twisting the base of the battery. Second-gen e-cigarette batteries are usually available in a starter kit paired with entry-level atomisers and these are ideal for the new vaper; not only are they simple to use but also changing the coils couldn’t be easier. When you’re quitting smoking, you don’t want to be learning how to operate a complicated device; your focus needs to be on enjoying your new method of nicotine delivery and so a second-gen kit is going to be your best choice. Over recent years these second-gen devices have improved a lot and many people who have used them to successfully quit smoking simply carry on using them on a long-term basis. Many experienced users of the third-gen and fourth-gen devices described below will often have a second-gen device in their kit to act as a back-up or for occasions when their larger devices may not be appropriate. Mechanical Mods– A mechanical mod is actually a very simple device– it only features a fire button, a battery compartment for an 18650 battery and a screw threaded connector for a tank- there is usually no electronic circuitry in it at all. They are definitely not recommended for beginners to vaping, because while a mechanical mod might be technically a very simple device, it is necessary to have a good knowledge of basic electronics in order to use a device like this safely. Used correctly by an advanced vaper who has a good understanding of volts, ohms, watts and amps, they are really effective at producing clouds of tasty vapour. Regulated Mods– These allow the vaper to control the voltage and/ or wattage power output of the mod and feature electrical circuits and software with special safety features to allow the device to cut-off if the batteries become overloaded. Although these devices can be very powerful, regulated mods are much more user-friendly than mechanical mods. In recent years, there have been so many rapid and new innovations in mod design that I think a new category of fourth-gen devices has been created featuring the most advanced technology on the market. Mods have been introduced with automatic temperature control features and the ability to handle special low ohm coils, as well as sub-ohm rebuildable tanks, which themselves feature adjustable and dual airflow slots. These are all light years ahead of the cigalikes and pen style battery powered devices and often feature LED screens so that you can check on important information such as resistance and power output. Some newer devices are even fitted with touchscreens. 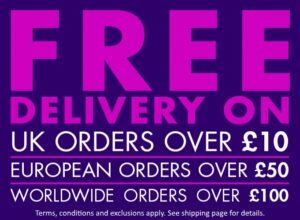 The atomiser tanks are bought in addition to the mod and a more advanced vaper then has full control over the type of coils and wicks with the aim of pushing the vapour and flavour towards the best vaping experience possible.